Percy, a two-year-old male, castrated, domestic medium hair cat, was presented to the Veterinary Teaching Hospital dentistry service when his owner found him at home unable to completely close his mouth. He was treated for a right temporomandibular joint luxation, and for added stability during healing, a custom-made tape muzzle was created for him. A tape muzzle, though not frequently used in the cat, is a non-invasive technique to manage certain maxillofacial injuries. A tape muzzle that maintains canine interlock but also allows the mouth to open far enough to let the tongue protrude can stabilize the jaws while still allowing the patient to drink and eat a gruel diet. A muzzle can provide temporary maxillofacial fracture stabilization prior to definitive treatment or adjunct stabilization in conjunction with more invasive treatment techniques. Because the jaws are not weight bearing and rigid fixation is not needed, a muzzle alone may provide enough stability to allow healing of unilateral mandibular fractures or of minimally displaced maxillary, mandibular ramus, or condylar fractures, although permanent malocclusion may result if adequate segment alignment cannot be maintained. Rigid fracture fixation is contraindicated in a growing juvenile patient, since it could interfere with tooth and skeletal development, but a muzzle could provide adequate stabilization, as healing would be expected to be rapid. As in Percy’s case, a temporomandibular joint luxation may be stabilized after reduction with a muzzle to allow soft tissue healing. The benefits of using a tape muzzle are its ease of application and removal, low cost, ease of production, custom fit, ease of emergency removal, and ease of repair or replacement. Since it is non-invasive, tooth roots, neurovascular structures, and the vascular supply to fracture fragments are not affected. 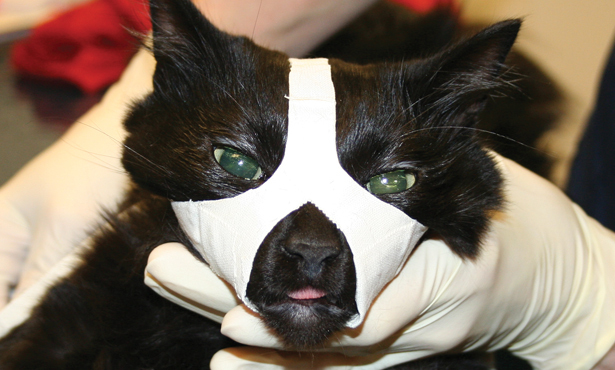 A tape muzzle may be custom-made for the feline patient, starting with the addition of a third, dorsal strap. The most common complication using a tape muzzle is moist dermatitis under the muzzle. As with any type of maxillomandibular fixation, a tape muzzle carries the risk of aspiration and in difficulty eating, breathing, and thermoregulating. A cat that cannot adjust to the tape muzzle could injure itself struggling to remove it. Most feline patients require use of an Elizabethan collar, and others will simply never tolerate a tape muzzle, and other means of stabilization are required. Contraindications against using a tape muzzle include canine tooth fractures that prevent the canine teeth from remaining interdigitated, a brachycephalic patient, respiratory distress or maxillary injuries causing difficulty breathing, vomiting or regurgitation, bilateral mandibular fractures, and injuries requiring complete immobilization of the jaws or surgical intervention, such as complicated, severely displaced, or comminuted fractures. A custom-made tape muzzle may be used instead of more invasive techniques to stabilize a cat’s temporomandibular joints during healing following reduction of a luxation. However, the candidate for tape muzzle use must be chosen carefully to ensure a successful outcome. For more about Percy’s TMJ luxation diagnosis and repair and a step-by-step description of constructing the tape muzzle, see the case report to be published in the Winter 2015 issue of the Journal of Veterinary Dentistry. Our dentistry service diagnoses and treats both simple and complicated dental and oral diseases. 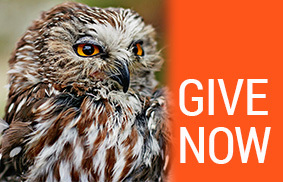 Please call our clinical coordinator at (217) 333-5859 if you have any questions.